July 2, 2018: You can trace the rising trajectory of the gay community in America through recent revivals of landmark plays presented on New York Stages. From vicious self-pity in The Boys in the Band to questing romance in Torch Song to revolutionary anger and AIDS advocacy in Angels in America, LGBTQ characters have transformed from pathetic outsiders to fierce warriors. Jordan Harrison’s new comedy Log Cabin, depicting a clash of ideals between two gays couples and their transgender friend, arrives Off-Broadway at Playwrights Horizons as the latest theatrical commentary on the gay/trans experience. Harrison has previously captured cultural collisions in incisive and moving plays such as Maple and Vine and Marjorie Prime, but here his conflicts feel manufactured and his protagonists are little more than animated talking points. The acton beings in 2012 in the tasteful urban apartment of lesbian wives Jules and Pam (Allen Moyer designed the handsome revolving set). The women are celebrating the forthcoming arrival of a new baby and the upcoming nuptials of their best friends, gay male couple Ezra and Chris. The quartet discuss the odd sensation of having won their major battles and lacking a driving direction. After a few scenes rife with witticisms, enter Ezra’s boyhood friend Henry (formerly Helen), whose trans status throws a monkey wrench into the other characters’ complacency. Harrison brings up vital points about the interconnections between the gay and trans communities, but the characters are not fully developed, so we care little about the outcome. Chris is African-American and Pam is Asian-American but their racial identities receive scant play as does Jules’ status as a transplanted Brit. Another Off-Broadway play dealing with gay issues is almost as surface deep. Ironically, shallowness, not just of the homosexual variety, is the subject matter. In another similarity, Joshua Harmon’s Skintight (at Roundabout’s Laura Pels Theater) raises interesting questions, but fails to examine them with any depth. Forty-ish Jodi has fled to the swanky townhouse (another exquisite set, this time by Lauren Helpern) of Elliot, her internationally famous fashion-designer father. Her husband has left her for a 20-something beauty. What she doesn’t know is Elliot, about to celebrate his 70th birthday, is living with Trey, a gorgeous young man, also in his 20s. To add spice to the comedy, Jodi’s gay son Benjamin, arrives and is drawn the hunky Trey. The playwright’s theme is the obsession with beauty which possesses or affects all the characters and by extension our entire society. Like Harrison, Harmon does supply us with a fair quotient of laughs, and while Harrison has not sufficiently developed his people, Harmon gives his more dimension. Yet they’re all whiny, selfish, and unlikable. He has created other unpleasant and/or narcissistic protagonists in previous works such as Bad Jews, Significant Others, and Admissions. But in those pieces they were complex, if deeply flawed. Here you just want to get away from them. Elliot neglects his family and is obsessed with Trey’s physical attributes. Jodi and Benjamin hungrily crave attention and lack compassion for anyone else. 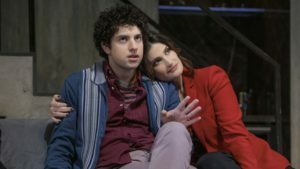 Trey is crude and boorish; Harmon tries to give him some sympathetic shading late in the play, but it’s by then it’s too late to garner any audience empathy. Fortunately, directors Pam MacKinnon and Daniel Aukin deliver taut productions and the respective casts are sharp and funny. 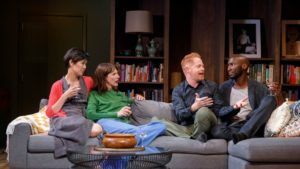 Jesse Tyler Ferguson of TV’s Modern Family displays his precise comic timing as Ezra and Cindy Cheung makes the most of the underwritten role of Pam in Log Cabin. In Skintight, Eli Gelb finds nuances in the disagreeable Benjamin, and Will Brittain does his damnedest to make Trey more than just eye candy. Idina Menzel and Jack Wetherall fare less well with the objectionable Jodi and Elliott. Both Log Cabin and Skintight deal with financially secure citizens moaning about first-world problems. Both playwrights are skilled at witty quips and plot structure, but it’s hard to get involved with either work past the chuckles. June 25—July 15. Playwrights Horizons, 416 W. 42nd St., NYC. Wed 7pm, Thu—Fri 8pm, Sat 2:30pm & 8pm, Sun, 2:30pm & 7pm. Running time: 90 mins. with no intermission. $59—$99. (212) 279-4200. www.ticketcentral.com.